“A BURDEN IS ALWAYS LIGHTER IF SOMEONE HELPS YOU CARRY IT” is part of our mission in supporting those families who choose Dignity Funeral Care to perform the final journey of their loved one. Itis now ten years since the Dignity Funeral practice first opened their doors in Loughrea. Tony Williams (owner) recalls opening in the middle of a recession and the intense challenges that brought. He sincerely appreciates the support of all the families who trusted Dignity Funeral Care at this vulnerable time. He remarks “This is hugely significant and a proud milestone in the development of our funeral practice. To commemorate this we want to present every family the opportunity to create their loved ones life story through a free memorial on Eternally Irish”. www.eternallyirish.com Ten years serving Loughrea merged with 45 years serving Portumna, Dignity Funeral Care continues to invest, develop and improve at the highest level of best practice. Loughrea native Geraldine Bane has joined Dignity Funeral Care and is completing her Funeral Director Certificate Award with the Irish Association of Funeral Directors. Geraldine has been observing practice and standards within the organisation and the strict code that Dignity Funeral Care adheres to in an unregulated industry. 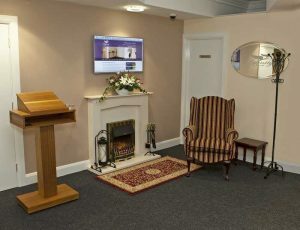 “It is not about conducting funerals, it is about conducting them better and operating best practice,I’m being trained to focus on family centred care and their need to grieve during a highly emotional event, ensuring the funeral director performs his duty without intruding on that vulnerable space” says Geraldine. Recounting personal loss Tony shares “I too lost my dad;I know loss is a difficult time where someone who understands our need for peace of mind helps us get through. All families need sensitivity, comfort and above all dignity at this time”. At Dignity Funeral Care we respect and value the families that place their trust in us to care for their loved ones. Our purpose is to understand their needs listening carefully to what they would like. Any arrangement is possible and can be performed simply or elaborately as desired. As funeral directors we know that people will forget what you said, people will forget what you did, but people will never forget how you made them feel. To be accepted into that inner circle is both an honour and a privilege when families are vulnerable with the pain of loss. Looking forward to the next ten years Dignity Funeral Care will continue to deliver professional funeral directing at an affordable price through best practice appreciating a great service at a fair price is superior to a fair service at a great price.